That is a loaded question, so I’ve decided to break up a blog into five different posts to address this question. This is Part 5 in the series on purchasing a new camera. To read or review Parts I, 2, 3, and 4 please view the blog. Should I buy a DSLR or a mirrorless camera? Should I buy a full-frame camera or one with a cropped sensor? Should I buy a new or used camera? How can I pair the right camera with my specific interests in photography? This blog post will cover the 5th and final question. This should be the easiest question to answer out of the five. By now you have read the four previous blog posts, and have a clear idea of what type of cameras are available based on your budget. It is common for many of us to have more than one interest. That doesn’t mean that you need more than one camera. One camera will suffice, but your lens choice could differ for each category. However, if you can narrow down to one category, your decision will be much easier. I recommend that you test a camera out before you purchase one. Consider how a camera feels in your hands, and carry it around with you for several hours. I once recommended a certain camera to a student where money was not an object. She tried it out and then went with a less expensive camera because it was smaller and fit in her small hand frame much better. Beginners who want to learn the basics photography can learn with any DSLR camera. A used camera or an entry-level type camera will do the trick and help save money. A cropped sensor camera made by any of the main camera manufacturers will work just fine. More serious hobbyists who would like to pursue photography past the amateur level should consider a higher end full frame camera. Those who are starting a photography business or upgrading their business will find a full frame camera will provide more satisfying results in low light. On the other hand, if one is pursuing landscapes only, a good tripod will enable one to capture images using a low ISO, where noise will not be an issue. Mirrorless cameras keep getting better and better. As of this last blog post, Sony has released their newest full frame camera, the a7iii, for under $2000. (body only). It is definitely worth taking a look at it. At only 22 ounces, it can be a great choice for travel. There are so many choices now for camera models, but the choice is yours. Read the five blog posts, test cameras, and read reviews and you are on your way to owning a new camera. Thanks for reading my blog. I hope you have enjoyed this series. If you would like more information about private lessons or one of my destination workshops, please contact me. We see a new phone coming every other day, most of the phones these days focus on features that attract a lot of users. Lately this focus has been more on a smartphone’s camera. The biggest problem is when it comes to choosing the right smartphone which has a good build quality and also a camera that clicks beautiful features. There are a lot of options and it gets difficult selecting one. The infographic has nicely described about the best of all the phones. To begin with, the latest phone by Google called Pixel 2 is a great phone and has shook all the DxO rating records. The DxO image score for Pixel 2 is 98 and DxO video score of 96. The Pixel was the first phone after the Nexus lineup was halted. Both these phones are great and have a stunning features that make them appear different from others. Both of them have a dual band colors at the back which allows for better reception. Next up is Apple, it’s a brand that has always been known for stunning cameras. Apple’s latest phone, the iphone 8 and iphone 8 plus. Both have a really great camera and now they also come with a BTS sensor. The iPhone 8 has a single lens with a 7 megapixel front camera and 12 megapixel rear sensor. If you are someone who has a bigger palm size then you should get the iPhone 8 plus which is a great phone that packs a much better battery like and even better camera, the iPhone 8 plus is capable of capturing portrait images as it has dua rear lens. Samsung’s latest phone, the Galaxy Note 8 is a great phone which does pack a lot of features, it also has dual rear lens and is capable of capturing portrait images. Lastly we will see two phones, one is HTC’s U11 which is a great phone and has a unique squeeze feature that allows to trigger any action inside the phone. Last phone is Huawei’s mate 10 pro. This phone has dual rear lens which help it capture portrait mode images. There are many such new entries coming. Hope you get to buy a good phone. That is a loaded question, so I’ve decided to break up a blog into five different posts to address this question. This is Part 4 in the series on purchasing a new camera. To read Parts I, 2 and 3, please view the blog. What type of photography am I interested in? This blog post will cover the 4th question: Should I buy a new or used camera? I usually recommend purchasing a used camera to students who are on a low budget and for new students who want to learn the manual modes on a camera. You don’t need an expensive or new camera to learn photography. If you think you would like to buy a used camera, research the brands and models and go back a few years to discover what was the most popular camera then. Find out the current shutter actuations. You can refer to this site to find out the shutter count on most cameras. Shutter actuations are important because camera manufacturers publicize the shutter rating of the camera. Most entry-level DSLR cameras are only rated at 100,000 shutter actuations. Mid and high-end cameras have more durable shutters that are rated between 150,000 and 300,000 actuations. Test the camera prior to use, even if it is just a quick trip outside. This, of course, would only be possible with a local seller. Ask if the camera has ever been damaged. The same question would apply if a lens is included. If it has been damaged, make sure you know the extent of the damage, i.e., body damage, and use this as a negotiating tool. Ask what accessories are included in the sale. Accessories typically included: a battery, charger, and at least one lens. Ask for the manufacturer’s warranty card if a camera is less than one year old. If the camera is older than one year, ask the seller to provide a warranty of at least 30 days. I have bought and sold many cameras online in the past fifteen years. My recommendation is to avoid sites that do not provide seller reviews. Craigslist is the first site that comes to my mind as one to avoid; e-Bay and Amazon are better online choices because seller and camera reviews are provided. Each company also offers some buyer protection. Online camera stores could also be a great place to consider buying a used camera. I often recommend KEH Camera, located in Smyrna, Georgia, as a good choice to buy a pre-owned camera. They offer many incentives to a buyer, including a 180-day warranty. KEH promotes its company as the world’s largest pre-owned camera store, so it is certain they will have a large selection of used cameras. Their staff is very knowledgeable and you can pick their brain to help you make a buying decision. therefore, buying a used camera can be a wise choice. Updated cameras with more bells and whistles replace older camera models every year. It is a good idea to research the leading-edge cameras from a couple years ago. I often recommend the outdated Canon Rebels (T3, T4, T5i) as options for a used camera. Often times, the money saved on a used camera can go toward a new lens. A good lens, such as a prime lens, can make all the difference in the world in making a good picture. Whether or not you purchase a new or used camera is a personal decision based on your budget, knowledge and aspirations. You can learn photography and take great pictures with a new or a used camera. I highly recommend you research a camera brand online before deciding on one and that you read my recent blog posts on the Five Questions You Should Ask Yourself before You Buy a Camera, Parts 1-3. An educated decision can help back-up your personal decision. I hope this blog has been helpful for those of you who are considering buying a used camera. If you need help learning how to use a used or new DSLR camera, check out my online courses, private lessons or immersion workshops. I have been teaching photography for nine years, and the most common question I receive from my students is, “What kind of camera should I buy?” That is a loaded question, so I’ve decided to break up the blog into five different posts to address this question. This is Part 3 in the series on purchasing a new camera. To read Part I and Part 2, please view the previous two blog posts. Should I buy a used or a new camera? This blog post will cover the 3rd criteria: Should I buy a full-frame camera or one with a cropped sensor? 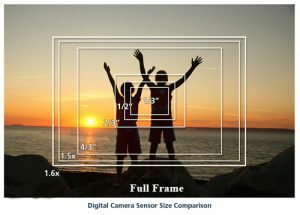 Understanding a camera’s sensor size will lead you to make a more educated decision on the purchase of a new camera. First of all, what is a sensor? A camera sensor in a digital camera is the rectangular plate that is behind the mirror of a DSLR camera. In a mirrorless camera, there is no mirror to cover the sensor, so it can be found when you remove the lens. The sensor captures light and converts it into electrical signals, which make up an image. Sensors are the most expensive part to manufacture in a camera, so smaller sensors are found in many prosumer cameras. These are known as APS and four-thirds sensors. A full-frame sensor, which is the same size as a piece of 35mm film, is more expensive to manufacture, hence it is found on more expensive cameras. Full frame camera next to a cropped sensor camera. Learning how cameras are labeled by sensor size will help educate you further. Cameras with a full frame sensor are also known as full frame cameras. Cameras with smaller sensors are known as cropped sensor cameras. Full frame cameras include some Nikon, Sony, Canon, Leica and Pentax models. Cropped sensor cameras with a APS 28mm sensor size include some Nikon, Pentax, Sony, Leica and Fuji models The APS 27mm cropped sensor camera includes some Canon models. The smallest sensor size of 22mm includes Panasonic and Olympus models. All the above cameras will produce an acceptable image, so how do you know which sensor size you should consider? The crop factor of 1.6 magnifies the focal length of a lens. A 35 mm lens on a Canon 6ti (APS sensor) would result in a true focal length of 56mm. There are advantages and disadvantages to a cropped sensor camera. The following image illustrates the different sensor sizes and the crop factors. That is a loaded question, so I’ve decided to break up my blog into five different posts to address this question. This is Part 2 in the series on purchasing a new camera. Read Part 1 here. Should I buy a used or new camera? This blog post will cover item 2: Should I buy a DSLR or a mirrorless camera? Mirrorless cameras have caught the attention of many wedding and travel photographers due to their compact size. There are many advantages to the mirrorless system as well as disadvantages. The shopping experience for a new camera can be much less stressful and complicated if you learn and understand what these are. Long story short, the mirrorless camera does not house a mirror like the DSLR camera, and because of this, the camera is smaller and easier to hold for long periods of time. I know many photographers who have sold their Nikon or Canon systems for a Panasonic Lumix or a Sony camera. Many experts within the industry project that the future of photography will be only mirrorless. I do not have a crystal ball, so I own both a DSLR (Canon 5d Mark 1V) and a mirrorless camera (Sony a6000). Which one do I like better? It depends on what I am photographing. A couple years ago, I went to the Dominican Republic for a family vacation. I was nervous to bring my expensive and bulky full-frame Canon camera. I purchased the Sony a6000 upon receiving many recommendations for it. It has all the same functionalities of a DSLR camera, such as selecting a shooting mode, adjusting white balance, ISO and picture style. The added bonus of this camera is the electronic viewfinder, where you can view the image live on the LCD rear screen. You can see the live result of increasing or decreasing the exposure, a live histogram, and any other adjustment made. I realized immediately that this was an incredible tool and a big advantage over a DSLR, where you can only see the final result after the picture is taken. With the EVF (electronic viewfinder) technology of a mirrorless camera, you can see the result before the picture is taken. On a traditional DSLR camera, the image in the lens comes through the camera and is bounced up into the viewfinder by a mirror and a prism. So what you see in the viewfinder is an actual, optical view of what the lens is capturing. There are no electronics in this process, much like if you were looking through binoculars. An EVF, however, is used on a mirrorless camera. On a mirrorless camera with an EVF, the light from the lens goes straight to the imaging sensor, which records the data and shows a preview of what the sensor captures on a tiny little TV screen viewfinder. It’s basically just a tiny version of the LCD screen on your camera when shooting in live view mode. The other advantage that I loved was the fact that I could easily carry the camera with me wherever I went on the beach or on trips around the resort. I could even carry it in my purse. I created many awesome images that rival the images I could have created with my DSLR. What I couldn’t make was a full-frame photograph. Because of the smaller sensor size, there is more noise when using a high ISO. Like everything else, it is a trade-off. Many of the newer mirrorless cameras that emerged in 2018 have overcome many of the obstacles in the past such as less lens choices and inferior video. Sony just released the A7iii which has a full frame sensor and many new improvements for under $2000. It is definitely worth checking out. I use two cameras for my work and play. I use my full-frame Canon mainly for professional use in the studio and outdoors. I often have photography sessions close to dusk and have to shoot in higher ISOs. I can shoot at ISOs up to 1600 without much noise on my Canon camera. I use my Sony a6000 for travel and short excursions. Day-time shots are fabulous when you can use a low ISO. Often times, I carry both cameras with me so I don’t have to change lenses. 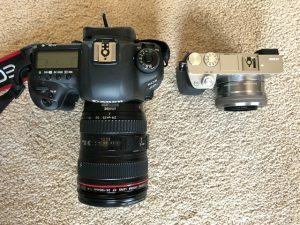 I realize that is a luxury most people cannot afford; therefore, I recommend you learn more about the mirrorless system before you make a decision. You can rent a camera for a week for as little as $100. Your decision should be based on what is appropriate for you. Mirrorless cameras are becoming more popular and sophisticated, and by this time next year, there will be more improved models on the market. I predict that more and more photographers will be opting for a mirrorless camera over a DSLR. That is a loaded question, so I’ve decided to break up my blog into five different posts to address this question. This is Part 1 in the series on purchasing a new camera. Make sure you subscribe to my blog, for future posts about cameras and photography. This blog post will cover item 1: What is my budget for a new camera? This is a good starting point for just about everyone. If you can afford a camera in the higher price range, you will have a lot more options. If you have a smaller budget, your choices are more limited, but that doesn’t mean you will not be able to take good pictures. Anything is better than a phone camera! This price range will afford you a brand-new entry level (also known as prosumer) DSLR camera accessorized with a kit lens. Canon and Nikon offer cameras in this price range. The most popular Canon cameras priced between $300 and $500 are the Rebel Series. The Canon 3t is at the bottom of the range, while the Canon 6t is at the top. Nikon offers the D3300 and D3400 in this price range. Look for Black Friday sales for the best price. Most cameras in this price range will include an 18-55mm kit lens. The lens is adequate for a beginner, but it may limit you because you will not be able to shoot at a wide or telephoto focal length. If you are new to photography and want to learn the basics, this is the route to go. You may have to do without automatic exposure compensation, but if you don’t know what this is, you probably don’t need it. This price range will afford you a newer Canon Rebel, such as the 7ti, or the Nikon D5600. Sony makes a great camera in this price range. The Sony a6300 is mirrorless camera. If you are not sure what a mirrorless camera is, stay tuned for my next article. In this price range, you can possibly expect a touch screen, a new and improved sensor, more megapixels, more focus points and generally more bells and whistles. If you are looking for 4k video, a tilt LCD, faster frames per second, a high ISO and a superb sensor, you will find many cameras in this range. The newest Canon cameras in this price range are the 80D and 7D Mark II. You might want to consider upgrading to a better lens than the 18-55mm kit lens, if you can afford a camera in this range. Pentax offers the K-1, with a whopping 36 MP full-frame sensor. A benefit to this camera is its weather seal. I would definitely check out this camera, as I have not seen any other full-frame camera under $2000. Several mirrorless cameras fall into this price range; again, I am a fan of the Sony a6500. 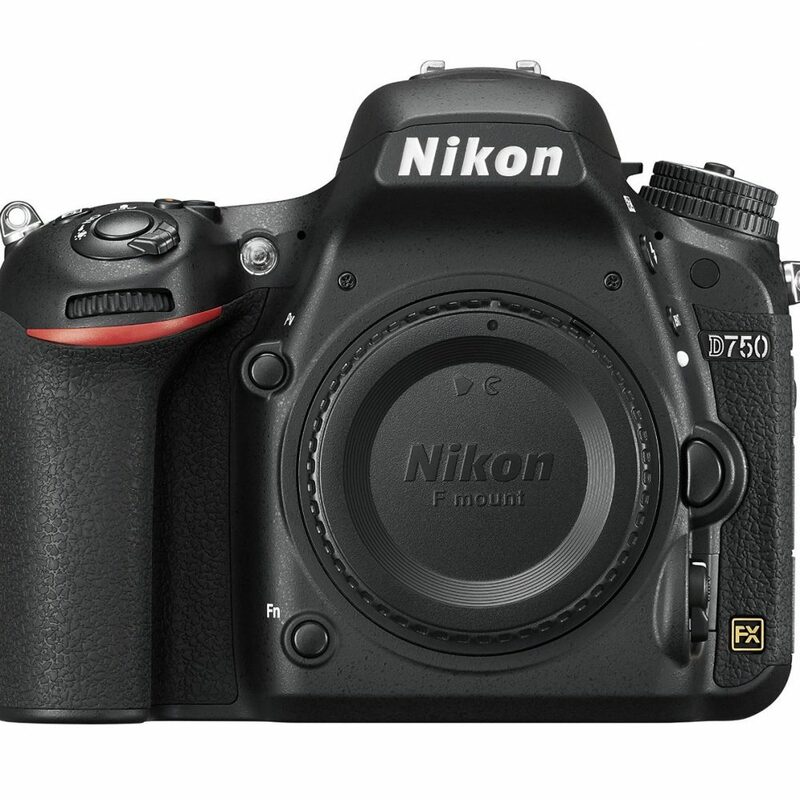 Nikon offers their newest cameras, D7500, D610 and D750, in this range. There are a lot more camera choices in this range if you can afford just a little bit more. Yep, $2000 and up is a big range, and it is where the full-frame cameras start. A full-frame sensor isn’t for everyone, but it can be a game-changer. With a full-frame sensor, digital noise starting at ISO 400 will be long gone. If you like to shoot in natural light, at dawn or at dusk, you should consider a full-frame camera. The Canon full frames start with the Canon 6D Mark II priced at $1999. The Canon 5D Mark IV is in the mid-range with a price of $3500 and the Canon ID X Mark II tops the range at a whopping price of $6000. The prices are for the body only. In this price range, you can expect not only a full-frame sensor, but such features as a dual pixel CMOS, a lot more AF points, 4K video, dual card slots, a 3.2” LCD and a top-of-the-line image sensor. The Nikon line-up starts with the D500 at $1996, followed by the D810 priced at $2996, and the D850 priced at $3296. The top of their line is the D5 priced at $6496. Again, the prices include the body only. The top-of-the-line Sony full frame is the Alpha a99II mirrorless camera. Packed with 42 mega-pixels and tons of other high-end features, this is the camera of choice for many wedding and professional photographers. It is much more lightweight than a Canon or Nikon DSLR. In summary, if you can afford a camera in the top range, you will not regret it, and it will give you a longer life than a camera in the prosumer range. If you are considering a camera in any of the price ranges, I recommend you visit the manufacturer’s website and do a comparison of the different models. 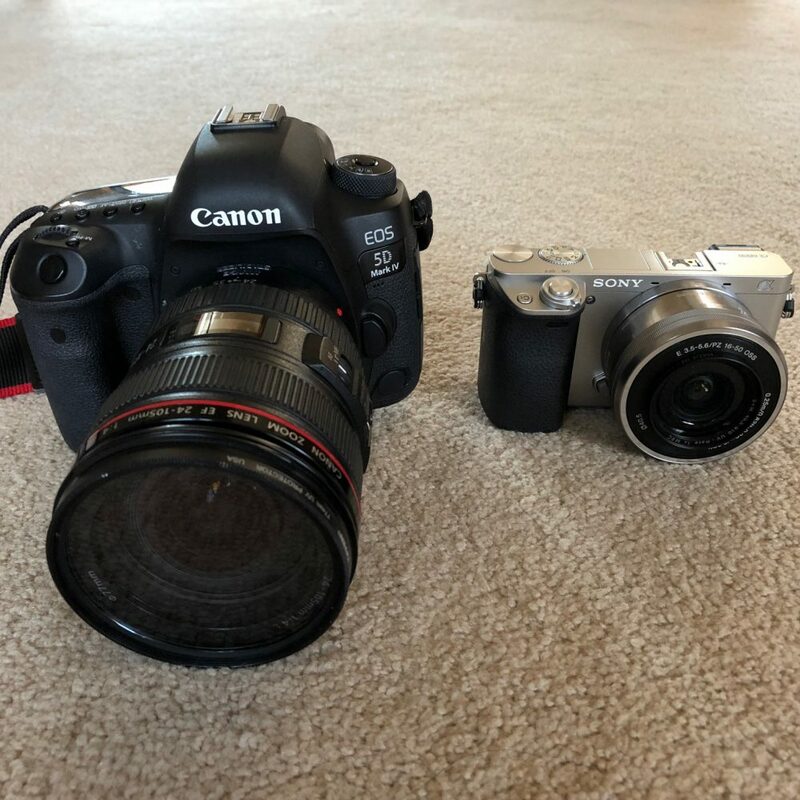 Stay tuned for my next article in this series: “Should I Buy a Mirrorless Camera or a DSLR?” If you enjoyed this article, please comment below and subscribe to my blog.